For most marketers, demonstrating ROI proves to be the most challenging part of lead generation efforts. But one of the best things about inbound marketing is that you can monetize your funnel and assign value to leads. 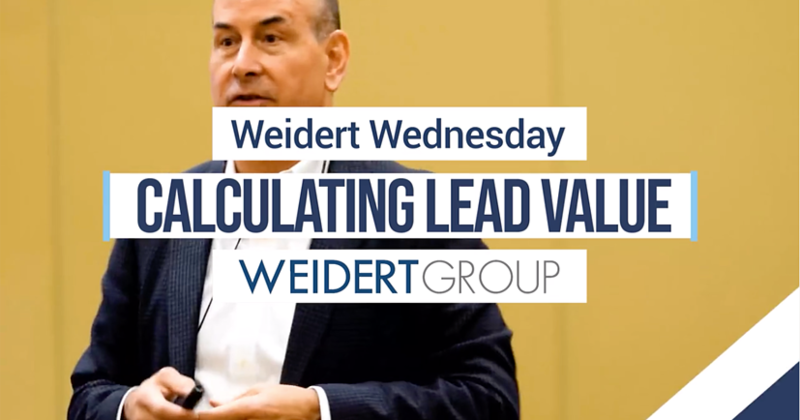 In this edition of Weidert Wednesday I’ll help you understand how Customer Lifetime Value and your closing rate can provide insight into the return you’re getting for each qualified lead. Sometimes people think they have a quick answer because they’re paying someone to “dial for dollars” and call names or businesses from a cold list. They know how much they pay for that service and for each appointment they set. In their minds, an appointment is considered a qualified lead — even if those people didn’t ask for meetings...and are probably regretting that they said yes as they’re hanging up the phone. So that’s not the answer I was looking for, since it’s about the cost of getting an appointment with someone who may or may not be interested in what they’re selling. When I ask about the value of a qualified lead, I’m trying to understand how many qualified leads they need to get one ideal customer. Is it 3, 4, 10? If they know what their closing rate is, then they have a process that they can improve, and also use to estimate the value of their lead gen efforts. The other key question is around Customer Lifetime Value, or CLV. The idea here is to consider that most businesses don’t sell just one thing to a customer and then never sell to them again. On the contrary, most business models have expectations of some level of repeat business built into them. Consider the first-time homeowner who needs a plumber for a sink repair. If the service was good, the repair completed quickly, the technician polite and professional, and the price fair, odds are good that the next time there’s a problem, the homeowner will reach out to that same plumber again. And the more the homeowner learns about other capabilities the plumber has, the more possibilities for additional business. It’s the same if you’re a foundry or a contract manufacturer or anyone providing a broad range of complex solutions: If your business typically starts with new customers by doing project work for one division, the estimated CLV for that customer might be 10 or 20 or 50 times the business you’ll do initially for the division you started with. Estimating CLV means looking at the aggregated revenue history with some of your best current customers, and making a judgment about how repeatable that could be as you pursue more of the same. Since most businesses look at the annual revenue of their top customers without considering the lifetime revenue, most people are surprised when they find out how much those top customers are really worth. Now you have the variables to answer the question “How much is a qualified lead worth?” The answer is simply CLV times your closing rate. Of course, you’ll quickly conclude that all leads don’t have the same value, and at the very least you’ll want to separate the whales from the minnows. Because now that you’re dealing with objective information to guide your sales activities, you know you don’t want to put the same resources behind fishing for minnows that you’re willing to devote to landing a whale. If you have more questions about calculating the value of your leads, let us know! Thanks for watching.